I’ve learned the “tuck and roll” method of falling. I’ve learned you need time to just lie and wait until everything falls back into place before getting back up. I’ve also learned that if you’re going down you need to protect your face, and as soon as possible, turn to the buttocks area – much more padding. I can count, since the beginning of last year, that I have fallen approximately five times, give or take a few more that are too minor to mention. I fell at the beginning of last year at work when they forgot to place a “wet” sign at the bathroom area. I was just walking along toward the bathroom and BOOM I was down. That was my worse fall in the last year. I had to wear a knee brace for a little over a month. That knee still bothers me every once in a while. I then fell walking across the parking lot to my apartment after working a late shift after removing my knee brace. It was around 2 in the morning and I didn’t see the hump in the road to slow traffic. Apparently, I was exceeding the walking speed limit and tripped so hard I flew over the speed bump and onto my face. I nearly broke my tooth. The velocity and lift disabled my tuck and roll method and so I started free falling. No, not like this song. I just like to place random old songs in my posts. So, that second fall was painful. I rate it a 7 out of 10 in pain. The first one was around a 9 out of 10. Uneven pavement is my worse enemy, as I age. You really have to watch for uneven ground. I was running after Mike and Sarah’s foster dog (they just told me they decided to keep her as their forever family, and so scratch the foster part 😀 ), Kona Bean (the name they gave her), who was abused by its owner. She is a cute little purebred Mini Pom that I just felt had to be saved. She was kept in a kennel and lived outdoors, rain or shine, snow or hail. She was left outside with no, I mean zero, human contact or any sign of love or affection. Can you imagine living your whole life with no one to hug or tell you they love you? She was severely under-weight at 4 pounds. 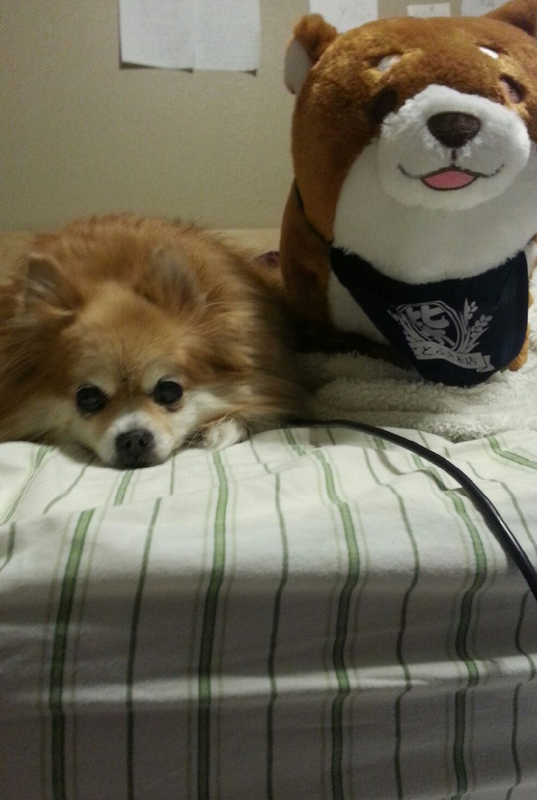 (Now, she is a mini Pomeranian, but that is ridiculously under-weight.) The vet could feel her bones sticking out. No fat, and basically malnourished. Well, the thing is she is so small and was so abused she is extremely skittish and frightened of everything and everyone. My daughter has a way of calming small creatures because she’s very non-threatening, and so this little dog has grown quite attached to my daughter. Well, I took her to the dog park to play and feel free and she kept running away when I tried to get her to leave with me. Which leads to my third falling story. I was able to tuck and roll, and so I gave that fall a 4 out of 10 on the pain scale. I lay on the ground for a while wondering how my life got to here. Even small, under-nourished dogs can out run me. For my fourth fall, it wasn’t as memorable as these three. It was more embarrassing, however, because it was while I was pumping gas at a station. There were witnesses. I placed the nozzle into my car and then decided to do something I never do, wash the windows. You know how they have those little squeegees by the gas pumps? I don’t usually use them, but for some reason I felt my windows needed cleaning. I grabbed one of those, walked around my car only to step on, you guessed it, uneven pavement. He did help me to standing. There was only minor bruising and so I wiped myself off. I’d give it a 2 out of 10 on the pain scale. My pants suffered much more. Don’t ever fall on old oil and gasoline stains. For my fifth fall I was equally embarrassed. I prefer falling when no one is around. Unless I need help standing. I was walking down the steps from my old apartment. No, I didn’t fall down the steps. I have fallen down steps when there was ice a few years back, but not recently. Anyway, I was walking down the steps and once I was down I was simply walking forward and fell. I rolled off the cemented area and into the grass. No uneven ground. Nothing to trip over. Simply my own two left feet. A nice young man walked by and asked if I was alright. Helped me to standing and when he saw I was fine went on his way. I limped to my car. Overall, I have thankfully not had major damage to any bones from falling. I know some people in my age bracket (late 50’s and on) can fall and be taken out for the rest of their aging years. Many times I had to help elderly with severe hip problems and knee problems. I’ve found out I have osteoarthritis in my knees. Something I wouldn’t have found out if I hadn’t fallen. I need to keep losing weight and staying healthy. As you age you realize health is very, very important. Love yourself. Also, the tuck and roll method. Learn it. It will save your face. So, we have to watch where we walk. Tread carefully. Pay attention to your surroundings. Even then, that won’t stop that ornery pavement from being uneven, or that random obstacle on the ground, or the fact you forgot to walk one foot at a time, but it will help. Take it easy and slow down. Here’s another good old song I’ll leave with you. One of my favorite bands of all time, The Eagles.